The first two people to feature as Crafty Pint "Beer Nuts" are both relatively new converts to the world of awesome beer. While Jimmy "Craft Beer Ideot" Swinglehurst and Scotty "Beardface" Thompson have accelerated from their first craft beer to their own brands of humorous obsession in no time, our third Beer Nut has been chasing his favourite ales since before many of our readers were allowed to drink alcohol. 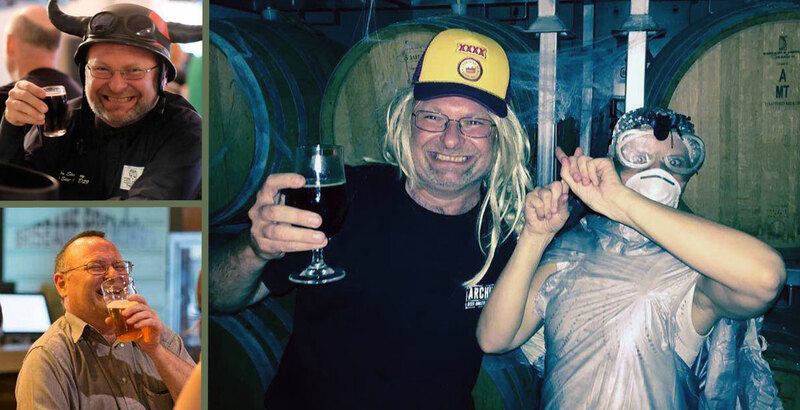 John Black, AKA Beer Tragic, is a familiar face around the venues of his hometown of Brisbane and regularly crops up at major beer festivals and beer weeks all over the country, always with a beaming smile on his face and displaying multiple forms of beer-themed attire. In advance of his favourite time of the year in Brisbane – Brewsvegas – he allows into his particular world of beer worship. I am the Beer Tragic! Ever since my first beer, XXXX Bitter (heavy) as a 15 year old, I have always loved beer! Back in early 90s at The Lord Nelson Hotel in The Rocks, Sydney, and especially "Nelson's Blood" porter! Then in Brissy around 2008 – I think when Matt Kirkegaard's craft beer tasting sessions [started] at the Platform Bar at Grand Central Hotel (where the original Fiehelly's Bar was my first watering hole in Brisbane when I started my first job at Queensland Rail back in mid 80s!). In June 2009, 100 different beers in first 10 hours in "Beervana", Portland, Oregon, USA, on my first trip to visit my brother who has lived there for 25 years! And then I had another 100 different beers in the next 48 hours and kept going! Needless to say I have been back to visit my brother three more times since and had even more great brews! Just love the United States of Beer! Last couple of years on Untappd but before that I have written down most of the beers I have had on bits of paper, especially all my four trips to the USA and one trip to Vancouver and London. Cascade Brewing's from Portland; Oregon cask-aged wild ale "Bourbonic Plague" was incredible and also my first ever Black IPA I had over in Portland. I found this fusion of hefty hops and roasty malts irresistible! I do not like unbalanced coffee beers or overly "spiced" beers they are probably my worst. Around 40 beer t-shirts & climbing rapidly! You bet! My shrine is a wooden living room high cabinet which houses all my beer stuff including beer magazines, coasters, etc – except the beers in the fridge or being "cellared"! How many unique beers do you reckon you've consumed? Most of my money is spent on beer and associated activities. I am the Beer Tragic, after all. My "dream" beer is dependent on the season and where I'm drinking it [but] is a beautiful roasty stout or Black IPA with high IBUs [international bittering units]! Thanks, John. Assuming the beers at Beervana were all samples! Can anyone beat 40 different beer t-shirts...? If you'd like to nominate yourself or someone you know to feature in a future Beer Nuts, please email us at crafty@craftypint.com.